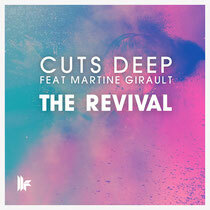 New London based production duo Cuts Deep make their debut on Toolroom with a remake of the infamous soulful classic 'The Revival' by Martine Girault. Giving the lush vocals a fresh lease of life, Cuts Deep add rolling beats and deep basslines to reinvent the track. The package also features four remixes from up and coming producers, including Copy Paste Soul, Giom, Deep City Groove and Long & Harris. Gathering DJ support from Annie Mac, T. Williams and Disclosure, new breakthrough artist Copy Paste Soul delivers a deep mix of the ‘90s remake, whilst Toolroom favourite Deep City Groove brings a tech inspired infusion to the package. Nu-disco hero, Giom, also makes his first appearance on Toolroom, delivering a funky re-work of the former number one. Regulars, Long & Harris, finish off the release with their own garage inspired re-vibe. It’s out tomorrow, have a listen below.